Steam in the Harz Mountains "GDR-style"
Oil-soaked soil, corrugated asbestos cement panels on the roof, Prussian red brick architecture, steel shed gates with single-glazed skylights, timbered top of the water tower and a black bakelite telephone in the turntable hut  the ‘Deutsche Reichsbahn’ (DR) in the last years of the GDR could often be accurately identified by these characteristics. And if you find four 2-10-0 class 50.35 in their final 1980s DR state in the shed then a time capsule seems to be almost perfect. We invite you to delve into a lost world, without the need for a time machine, because there is still the "Bw Swl" - the Salzwedel depot. Since the end of the GDR it has had no renovations. It remains almost unchanged since the last Reichsbahn employee turned off the lights. 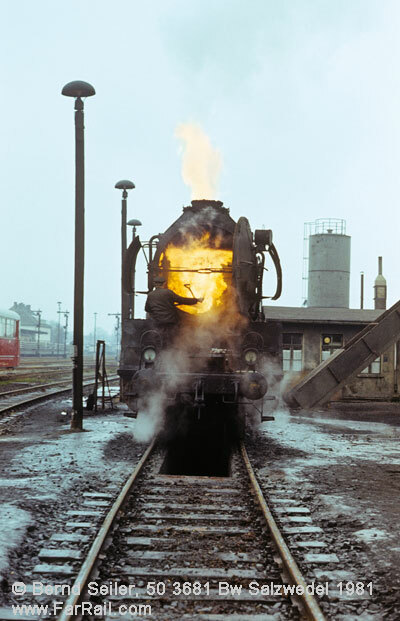 The locomotive collection of the club “Dampflokfreunde Salzwedel” (Steam locomotive friends Salzwedel) is still in the holy roundhouse of this gem. 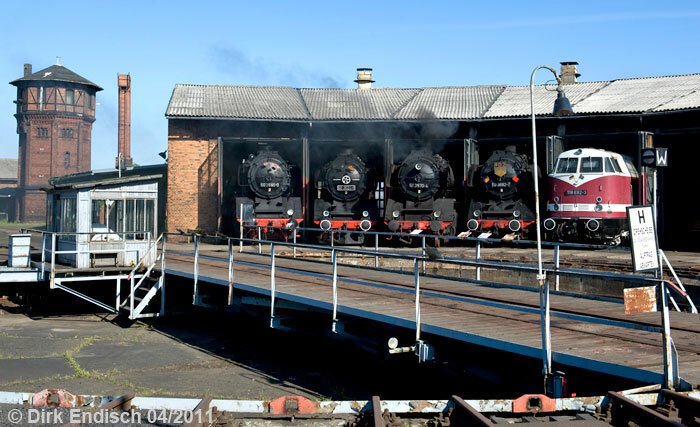 But shortly after our event they have to transfer all their locomotives to the nearby depot at Wittenberge. This opens Salzwedel’s doors for the local graffiti scene, stone throwers and metal thieves. Once the club has left Salzwedel, the demise of the historical depot of the Altmark is foreseeable. Unfortunately the authorities are not interested. So last call for one of the very last almost untouched, original East German depots: photo and video event on 11th and 12th of February 2012. Transfer from the railway station Salzwedel to the historic depot, locomotive parade, shunting in the depot and short, but authentic steam train on the approach track, loco servicing, turntable shots, in the early evening canteen-style dinner and on with night shots in the, hopefully, wintry depot. Transfer from the depot to our hotel in Salzwedel. The locomotives will be in the state of the early 1980s, as will the number plates. All our locomotives were based in the north of the GDR in their last years of service for the east German state railway. 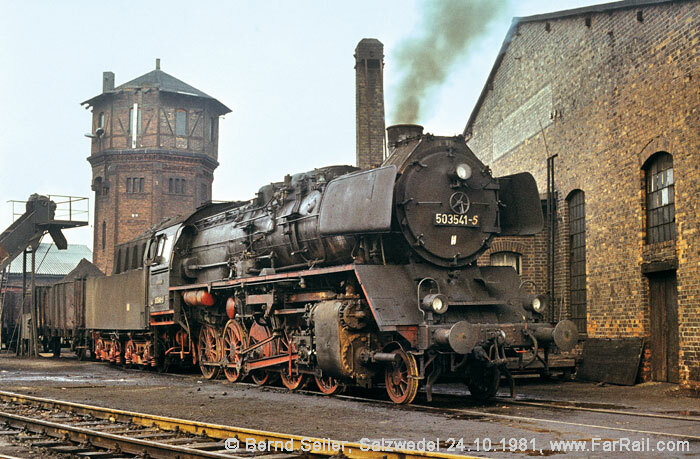 Salzwedel used this very class of steam locomotives until 1987. We’ll try to make the cold locomotives look alive. For dinner, we'll light a grill. Dinner and drinks are available directly from the club members for small money. When walking around while shooting please try to avoid getting in the picture of other photographers and video film makers. Occasionally we’ll arrange fixed photo lines or mark certain photo areas to make sure everyone on the event is able to get some excellent pictures. Since only one steam locomotive is operational and no-one is able to guarantee that no technical flaw will occur we’re unable to guarantee that the loco will be in steam. If any compensation can be paid in this unlikely event, depends on the club Dampflokfreunde Salzwedel e.V. Please note that you will stay on a site, which does not correspond to EU safety standards. But the risks are minor as long as one opens the eyes and uses common sense. Neither the club nor FarRail Tours can be held responsible or are liable for accidents of any kind, damages, losses, delays, etc.